CANBERRA -- The last parliamentary sitting day for 2015 is ending on a less than spectacular note for Prime Minister Malcolm Turnbull with a former Liberal Minister defecting to another party, another two rumoured to be doing the same, and a senior Turnbull Minister fighting to keep his job. Just after returning from the Paris climate summit, Turnbull was informed by dumped Abbott Government Industry Minister Ian Macfarlane of his intention to jump from the Liberal Party to the junior Coalition member, the Nationals. The Nationals party room late Thursday formally welcomed the politician who is known in political circles as "Macca” or “Chainsaw,” due to his distinctive voice. The move is likely to give the Nationals a fourth seat in the Turnbull Cabinet. “I was very disappointed not to have an opportunity to serve under Malcolm Turnbull as Prime Minister, “Macfarlane told reporters in Canberra. Despite the move, which began a “very long time ago,” the soon to be Nat insists he is a “huge fan of Malcolm”. “It is actually a huge vote of confidence in Malcolm Turnbull, because the alternative was to leave parliament,” he said. It is understood another two Liberal MPs have been in talks to follow Macfarlane. The Deputy Prime Minister and Nationals Leader Warren Truss said he has not spoken one of those names on Thursday, Queensland MP Scott Buchholz. “If he was to seek to come into the Party Room I'm sure that he would also be welcome but that is entirely a matter for him and it would also be a matter for him to discuss with his Federal divisional council,” Truss told reporters. Buchholz, meantime, is doing his own PR. It’s expected the long-time Liberal Industry Minister, will seek a senior Nationals portfolio in the Turnbull Government. Truss insists there have been “absolutely no commitments given to Ian (Macfarlane) that he will become a leader” or receive any other position. The veteran MP, who holds the Queensland seat of Groom which surrounds the city of Toowoomba, has offered his credentials. “I have got five (Akubra hats) and I have got seven pairs of RMs,” he declared. Macfarlane is not a Nat yet. There are administrative processes that need to be followed. Earlier, he had little fun in question time, arriving late, grinning from ear to ear and brandishing a Labor Party membership form. 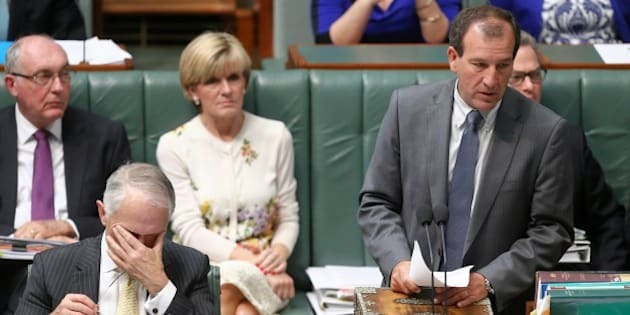 Meantime, the Special Minister of State, Mal Brough remains in his portfolio, despite rumblings within the Turnbull Government over his involvement in the Peter Slipper/James Ashby affair and an ongoing Australian Federal Police (AFP) investigation.